As the Temple is overcrowded at the time of Abhishekam, Maha Mangala Arati and darshan, devotees should safeguard their ornaments and purses from pick pocketers and take care their children. Care should be taken not to leave any belongings in the Temple. 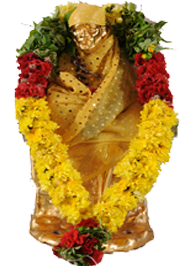 Offering to Sri Sai Baba in cash or kind can also be made at the donation counter against a receipt. Devotees should bear in mind that Baba left no heirs or disciples and should guard themselves against such deception practiced by impostors. Devotees are warned against practitioners of black magic professing allegiance to Sri Sai Baba and also against those circulating chain letters, asking the receiver to send a certain number of copies of the letter to his friends. All donations for oil for the Nanda-deep and for firewood for Dhuni in the temple are to be given in the office only. Further details regarding these can be obtained from the Temple incharge. in case of any emergency Medical facilities are available very near to Temple. The Sri Naga Sai Trust, has not appointed any representative for the purpose of collecting donations in cash or otherwise. Devotees are informed that no donations either in cash or otherwise should be given to anybody personally. This is to avoid deceit as well as to prevent devotees from being cheated by unscrupulous elements. Devotees are requested that they should not keep of their foot wears any where except Chappal stand. it is near main two wheeler parking entrance. Devotees are requested help us to keep the environment clean. Devotees are requested Keep Mobile in silence mode during darshan. Do not hand over mobile it to unknown Person. All the devotees, especially women and diabetic persons, are requested to eat some food before joining the darshan queue as during heavy rush days time required for darshan.